Read the latest Schall HTML documents right here. This web site's title comes from a book of mine by the same name, a book with a very long sub-title, of which I am rather proud. "How to get an education even if you are in college." I might add, "even if you are out of college or if you never dreamed of going to such an unlikely institution in the first place." But relax, this is not a site devoted to the technical subject of "education," but rather to "learning," to anything worth knowing. What the reader of this ANOTHER SORT OF LEARNING WEB SITE will find are numerous suggestions about learning, about reading, about what to read. Many people, in reading what is said to be important, often miss the significance of what they are reading. They also miss a number, not too many, of very wise books that no one else recommends to them. If someone chances onto this web site, he will find various items, things to read and to know about, things that, when actually read, he will find sometimes fascinating and delightful, sometimes sober and provoking, things of the greatest importance about what is. Likewise, I am a great fan of essays. Many sections will include selected essays, which I will try to change once in a while on this web site. The browser will find here different kinds of subject matter. My academic background is in political philosophy, so some of that will be there. Naturally, I am interested in religious issues. It often takes a lifetime to manage well one discipline or even one small area of a discipline. Still, much is to be said for being interested in many things. Somehow, if you stick to just one thing, you will find that you will not know even that well, as other things are necessary as background or explanation. Nothing is wrong with this. The amount of knowledge available to us is simply overwhelming. On the other hand, we are not gods. It is all right to be content with what we can know in the time given to us. The old idea about knowing a "little bit about a lot of things" is not at all a bad idea. Someone who chooses or chances onto ANOTHER SORT OF LEARNING WEB SITE, with the help of the Site Index, can quickly gain an overview of the material presented here. In addition, there will be guides to the location of books and essays of, or those suggested by, the author . "I am always for getting a boy forward in his learning; for that is a sure good. I would let him at first read any English book which happens to engage his attention; because you have done a great deal when you have brought him to have entertainment from a book. He'll get better books afterwards." 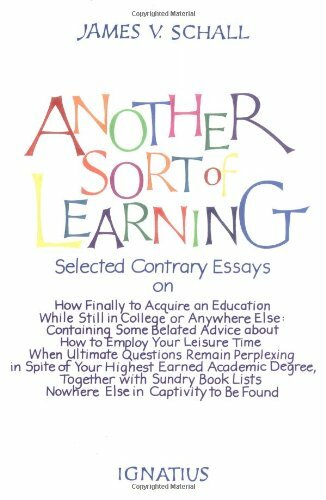 Let this ANOTHER SORT OF LEARNING WEB SITE be a guide for everyone to this "forwardness" in "learning" and to this "afterwards" of "better books."